Drones are relied upon to play a key role in the smart city environment, providing support for a range of use cases. Smart cities India is all set to become the most-populous country in the world by 2030, making it the home to the biggest and the most under-penetrated market for global manufacturers and service providers. Drones are becoming a necessity for smart city survey in India growth. 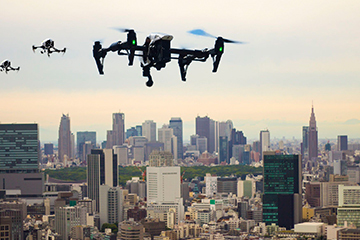 Apart from household fun, drones have become a popular tool for city inspections, business advancement, and disaster relief. With built-in 3D mapping and cloud technology, drones provide cities the ability to track and record data they never could before. Drone surveillance allows city planners clearer visuals over construction and development sites. We offer our valuable services in the domain of City Survey, which caters widely to highway engineers. With the help of our proficient engineers and professionals, we conduct our services by collecting data with respect to highway surveying with a high point density. Areas that were previously too hard for inspectors to access are now in reach with the help of drones. Planning- One large benefactor from smart city drones has been streamlined building inspections. Drone surveillance allows city planners clearer visuals over construction and development sites. Areas that were previously too hard for inspectors to access are now in reach with the help of drones. This technology allows construction projects to track progress, productivity and make comparisons through analyzing images captured above work sites. Sewerage & Sanitary- The city uses smoke testing to determine connections between the city's sanitary and storm water sewer systems which the city has" taken pains to separate to stop sewage spills during large rainfalls. we offer the city survey across the country are discovering public uses for drones, including inspecting ditches and bridges, this will be a first for the city’s public works department. The City feels that using drones would be more efficient and will keep the crews safer. Real Estate Survey- In general real estate use, you’ll most likely stick to residential areas, but there are some places you should be aware of where UASs are strictly prohibited. These include stadiums and sports events, emergency response efforts such as forest fires and less than five miles from any airport. Using drones for real estate survey photography will become increasingly common now that it’s easier for real estate agents to operate them. Now that federal, state and industrial organizations agree on the major points, drone adoption and operation will quickly escalate. Here we are one of the first in this area to offer clients that service with making stand out from the competition while adding a serious wow factor of marketing. Encompassing aerial views of the entire property and land. What the drive home or the kids’ walk to school looks like. Confirming condition of the roof and other property features that are difficult to access. The area and encompassing zone, including the home's nearness to comforts. Civic developments or local improvement districts (LIDs) that the buyer’s property taxes might contribute to.